We used to ski at Alpine every year or so when the kids were learning to ski. When we were going there they had some great lift ticket deals for kids, so it was popular with families. They would also often stay open into late May or June, so we did some late Spring skiing there. We haven’t been back in a number of years since we now have a house in South Lake Tahoe. Although we are not Alpine regulars, we have always had a great time there. 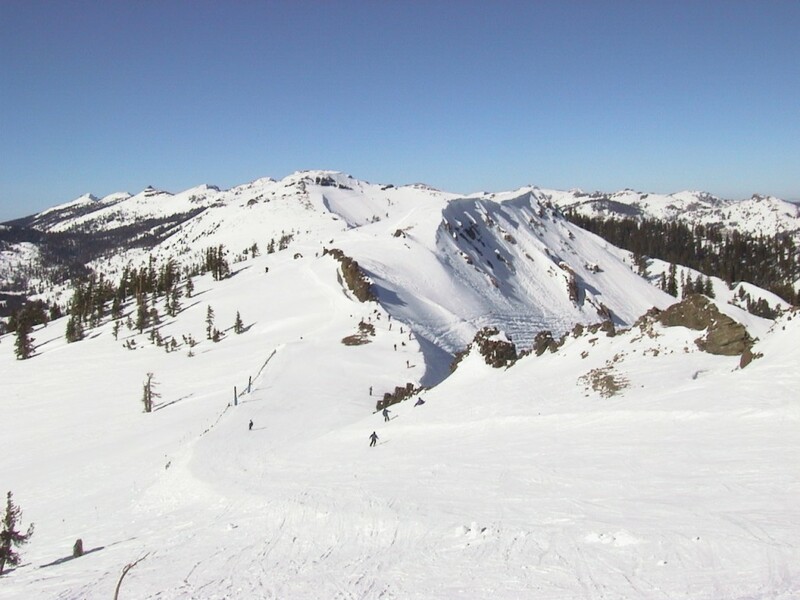 It is a very interesting area with a nice variety of steeper blue and black runs, and a large open bowl on the back side called Sherwood. They do some steeper grooming than a lot of places do. 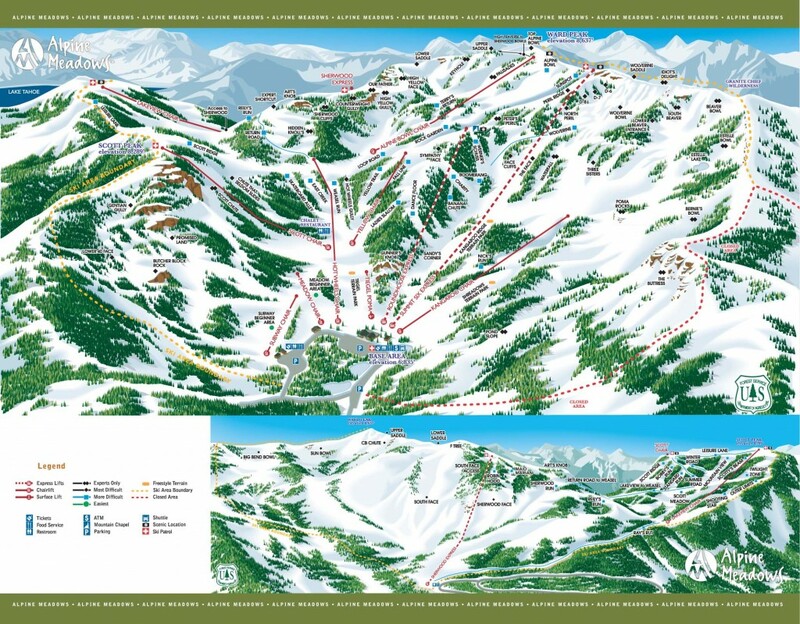 There is some great easily accessible side-country that attracts a lot of experienced locals, much like Kirkwood does. In fact Alpine and Kirkwood are very similar in many ways, with a similar vibe about the place. There are plenty of steeps to be had on just about every aspect of the mountain, so this is a great place for experts. Advanced skiers will enjoy the steep groomers and bumps. There is some easily accessed sidecountry. Actual reported snowfall is in the top 10 for North America. Long lines at the Sherwood chair on weekends. Some of the other chairs like Lakeview and Scott could use updating. There is only 1800 vertical, and much of the top is steep so long blues are absent, and most of the runs will be top-to-bottom runs, which feels a bit limiting at times. The elevation is too low and the snow quality suffers because of it. 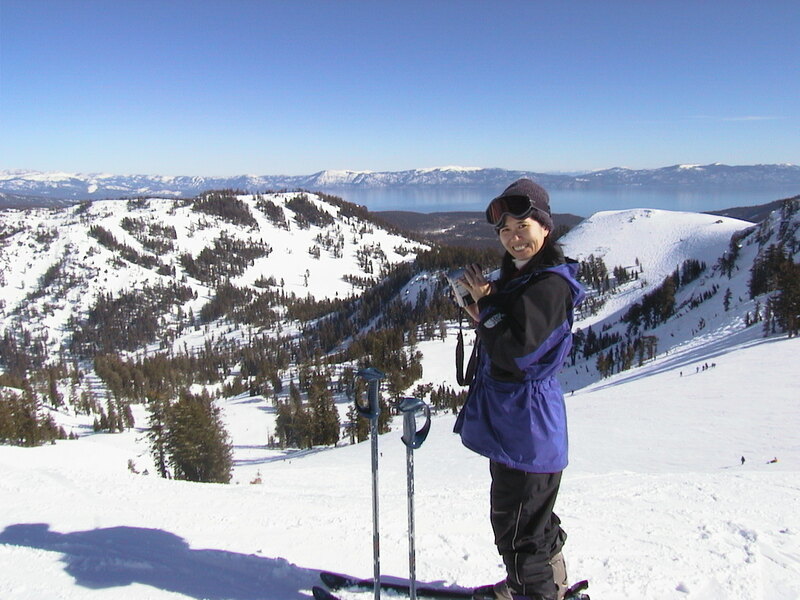 Alpine is a great resort and if we lived in the North Lake Tahoe area it would probably be one of our regulars on a rotation along with Squaw and Northstar. However, we chose to live in South Lake due to the better overall skiing experience (for us) at Kirkwood and Heavenly so it doesn’t really end up on our list of resorts to ski any more. Once Alpine and Squaw are linked it will probably get more attention from us since it will become a huge area when combined. UPDATE: Went back for some late spring skiing May 10, 2014 because Alpine was the last resort standing in Tahoe. Not much to add to the review except that Squaw really needs to spend some money there and at least upgrade/remodel the base lodge. It’s really getting bad.